The Natracare brand of organic skin protection claims on its website that conventional menstrual pads are made of “90% plastic”. An unverifiable figure, but likely. “Did you know conventional menstrual pads are made up of 90% plastic materials? !” The brand Natracare, a pioneer in organic sanitary pads, uses this astounding figure to appeal to potential customers on its website. That’s because, unlike the major brands Nana, Always, and Vania, Natracare makes feminine hygiene products out of cotton and uses zero plastic. They’re not the only company to do so: in the last few years, Jho, Naty, and Love & Green have also entered the burgeoning trade in organic pads. They all position themselves in relation to mainstream brands by playing up the eco-friendliness and the “healthy” aspect. These brands believe that plastic is especially bad for the environment and for women’s health, being derived from petroleum. But the figure cited by Natracare—that conventional pads are 90% plastic—is quite vague. Nevertheless, as will be shown, this is still probable. 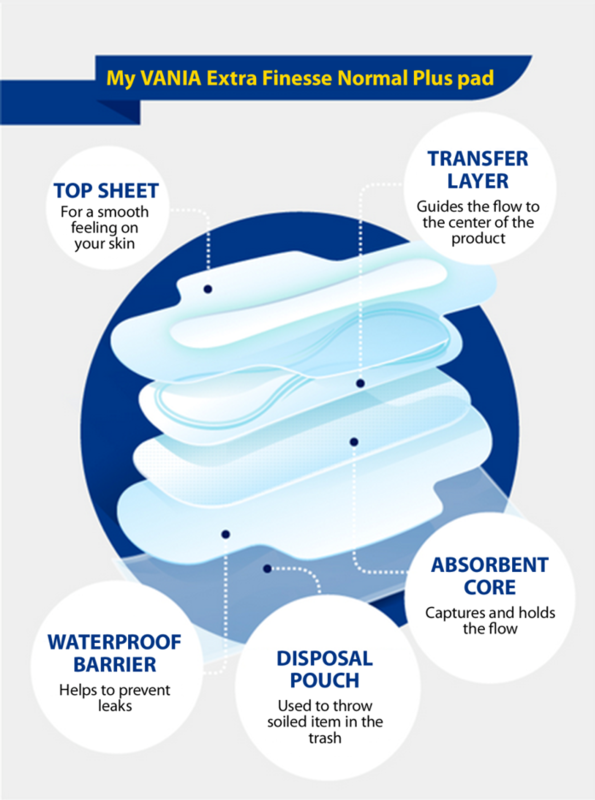 There are indeed several plastic materials found in all layers of the pad, even in the thickest and most absorbent products. Where does the brand get this information? When contacted, they do not reveal their sources, nor do they specify if the 90% figure refers to the number of components in a pad or to its weight. Let’s assume this is referring to the number of components. Nana, Always, and Vania, the three giants among “conventional” sanitary pad makers, could not be reached for comment. On their websites, however, they provide summary lists of ingredients. With Nana, there is plastic in the first layer (non-woven material made of polypropylene, or a blend of polypropylene, polyethylene, and polyester), the second layer (polyester fibers), the absorbent core (superabsorbents), and in the fourth layer (polyethylene coating). No quantities are given, and the term “superabsorbent” is not explained. With Vania and Always, it’s quite similar. Even the magazine 60 Millions de Consommateurs, which examined the question in 2016, does not offer any other specifics. They claim to have analyzed the composition of sanitary pads available in France, and attempted, “not without difficulty,” to establish an exhaustive list of their raw materials. But the components are identical to those listed on the brands’ websites. Once again, no figures are available, and the magazine could not be reached for comment. However, according to Clément Perrin, a second-year doctoral candidate in the physical chemistry of polymers at the University of Lyon I, the “90%” figure provided by Natracare is “very probable.” He says there is plastic in almost all layers of the pad. Even in the absorbent core, whose composition is never specified, except that it contains “superabsorbents.” This term is used as a shortened form of “superabsorbent polymers,” but according to Perrin, there is only one superabsorbent polymer: polyacrylate. “This is a petroleum derivative, meaning a plastic,” the PhD student explains. What do government agencies say about this? ANSES (Agence nationale de sécurité sanitaire de l’alimentation, de l’environnement et du travail; the French Agency for Food, Environmental and Occupational Health & Safety) published a report on the composition of feminine hygiene products in June 2018. This document is available on its website. But here again, no figures are given about the presence of plastic in pads. The information is more or less the same as that provided by the companies. According to Aurélie Mathieu, director of scientific projects at the ANSES Risk Assessment Directorate, the agency does not have these numbers. “Companies were not asked to provide this information. The goal was to assess the safety of products from a chemical standpoint,” she explains. Why is it so difficult to access this information? In fact, at the European level, sanitary pad manufacturers are not required to release an exhaustive list of their components—even less so their proportions, then. On February 29, 2016, the MEP of the Europe Ecology – The Greens party Michèle Rivasi appealed to the European Commission on this issue. On May 13, the Commission responded: as feminine hygiene products, according to several scientific studies, did not pose any health risks, they could not require manufacturers to make their ingredients public. To date, then, in order to find out if the figure cited by Natracare is exact (that plastic materials represent 90% of the weight of non-organic sanitary pads), one would have to order a new chemical analysis to be definitively certain. However, given that plastic is found in all layers of standard pads, it is possible that plastic materials represent a very large proportion of their components. In short : We hesitated a lot with the mostly false rating. Some of our group wanted it to be “mostly false”. But ” the “90%” figure provided by Natracare is “very probable.” but not 100% sure… It is uncheckable and we know our reader will make their own opinion. Leave your comments, thoughts and suggestions in the box below. Take note: your response is moderated. PreviousPrevious post:Blog: Pauline Decrypts PlasticNextNext post:Blog: 1, 2, 3 Factcheck!